“There is a real trend towards something called variously urban agriculture, indoor farming or vertical farming,” says Cary Mitchell, a horticulturist at Purdue University in West Lafayette, Indiana. The original idea was for skyscrapers filled with plants but was never realistic. Skyscrapers don’t come cheap. In New York City, a company called Gotham Greens has built several greenhouses on the roofs of buildings. One supplies the supermarket beneath. There aren’t many suitable sites. Greenhouses typically use more energy than growing plants in fields – they need cooling in summer and heating with extra light in winter. 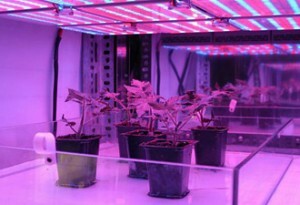 “The advent of LED lighting has made this sunless form of vertical farming possible. High-pressure sodium lights have been used by growers for decades to supplement the winter sun. LED’s are no more efficient at converting electricity to light than the latest sodium lights, but crucially are a much less concentrated source of heat. “They can be positioned closer to plants allowing plant growth on shelves,” says Bruce Bugbee of Utah State University in Logan. This means that many more plants can be grown in a small space. The government-subsidized Miyagi farm in Japan, where plants grow all year round in racks 16 layers deep, is reportedly 100 times more productive per square meter of land than an outdoor farm. 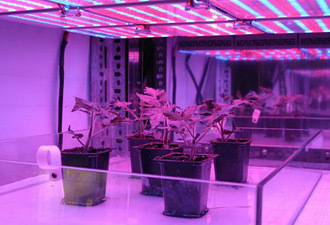 Fans of indoor farming, however, claim that advances in LED’s are now making indoor farming more than just a way of growing expensive plants. 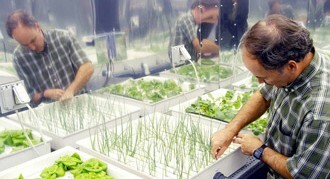 Some have even suggested that this is the future of farming and could help solve the world’s food crisis. But for Bugbee, nothing fundamental has changed. “It is possible to operate a business growing specialty crops indoors sold to specialty markets,” he says. “But the idea of growing our staple crops in vertical farms is ridiculous.” Louis Albright of Cornell University in Ithaca, New York, has calculated that growing enough wheat under electric light to make a loaf of bread would run up a $23 electricity bill. Growing food locally does greatly reduce food miles, but that doesn’t necessarily mean lower overall carbon emissions. In 2008, Albright produced a report for the New York State Energy Research and Development Authority on the emissions associated with food imported into the state compared with the same food grown locally. For lettuce, he has calculated that about 0.7 kg of carbon dioxide is produced per kilogram imported into the state. But lettuce grown locally in heated greenhouses with supplemental lighting was typically even more carbon-intensive – at up to 2.4 kg of carbon dioxide per kilogram. Comment: It pays not to allow enthusiasm to overwhelm arithmetic whenever one is engaging in something new.